Barbara continues to give talks to clubs, groups and associations on the work of the NATANDY Fund. 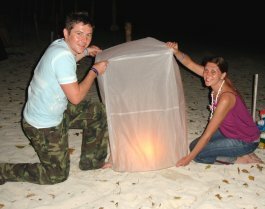 Do you know about the Tsunami Support (UK) Charity? Sandra spent considerable time during the autumn compiling a 2011 Calendar of Inspirations - all full of advice "always laugh when you can-it's cheaper than medicine" and some very poignant "make the most of every moment-life can change in a heartbeat." Sandra raised £273 from the sale of the calendars. Barbara & Roger have moved to live in South Warwickshire. Now they are settled in their new home Barbara is looking for opportunities to speak to groups about the work of the NATANDY Fund in order to raise funds and sell her handcrafted cards. In December Barbara gave a presentation to the Stratford-upon-Avon Inner Wheel and raised just over £90 from the sale of cards. Once again the Rotary Club of Scunthorpe supported the NATANDY Fund in a very generous way by making donations instead of sending Christmas Cards as well as donating the proceeds from the Christmas Quiz. Sandra and Ted organised a Car Boot Sale on the Legbourne Community Centre field on a very hot Sunday in July. The Car Boot Sale drew many stall holders and hundreds of "car booters" and was a resounding success. Many thanks to the helpers and volunteers who did a sterling job. A total of £763.40 was raised including donations. Sandra held a Flag Quiz at her Latin American Garden Party and raised a further £25 and £25.60 was collected at the end of year concert at Legbourne Primary School. We visited Krabi where we saw our 3 orphans and Robert Reynolds. Tirayoot was accompanied by his grandmother and uncle, who they now live with as is their custom after the death of the grandfather. Four year old Tirayoot is a very lively little boy with a likeable personality. Payayat was also with his grandmother. He is a shy boy, well mannered but rather quiet. We were told that his grandmother keeps a clean home and is always careful to see Payayat is smartly dressed. Sugunyah is apparently a very clever girl. She has recently sat tests for a scholarship and her sister is of the opinion that she will get one. She is looked after by her older sister and brothers. We took them to a store in town first for ice-creams, where as is typical of little boys, Tirayoot and Payayat chose the biggest and most colourful on the menu. Then we went shopping. Tirayoot wanted a digger but as the store didn't have one he had to be content with a battery operated elephant. He also chose a couple of shirts, shorts and a hat. Payayat selected a remote controlled car and a Chelsea football kit. Sagunya chose stationary for school - pens, files, folders etc. We visited the Community Centre which we have sent funding to. Although not quite complete it is a nicely laid out building with large rooms and spacious grounds. It was good to talk with Robert and to meet the children. The aim of the Foundation is to be able to fund the orphans with sponsorships until they are 18 or leave school to work. The next day we went to Phi Phi. The island is just as over-crowded with so many new buildings and stalls that it is quite stifling. The Memorial Wall has been pushed back and the sea view is blocked by shops and stalls but the plaques remain. The flowers and plants have all grown well although it appeared a little over grown. I didn't manage to find out who is responsible for the upkeep of the garden. The area where the reservoir was has been turned into a lovely garden by the Danish community- over 300 bodies were removed from the reservoir following the tsunami. When we travelled up country to Khao Lak we felt it had been taken over by the Germans and Swedes. We saw the police launch, the tsunami museum and the memorial. The Volunteer Centre is planning to close this year as they feel the Thai's are now able to cope. We went to the Eco Tourism Centre which is now partly funded by the Thai government. We spoke with Kang who used to work at Cape Pakarang Boatyard with Scott. Since Scott left to move on to Vietnam to do more voluntary work the boatyard has been turned into a restaurant. Kang took us to see the NATANDY -Together Forever boat and introduced us to Lim the boat owner. The Thaikea Furniture Projects have been handed over to the Thais who are still operating them as shops and teaching skills. 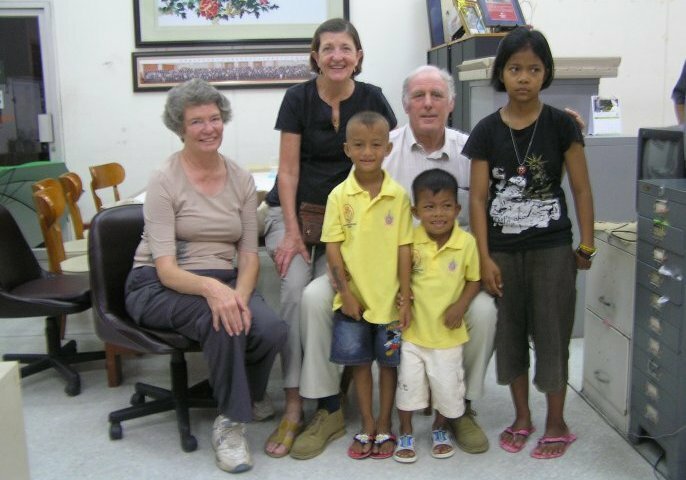 In our opinion only the orphans and the Sriphong Phukaoluan Foundation need our support now. This year Sandra & Ted attended the City of Lincoln Swimming Club Presentation Evening. The Club had played such an important part in Andy and Nat's lives when they were members that we are pleased to be able to give some encouragement to the present generation of young swimmers in the form of the NATANDY Trophies. 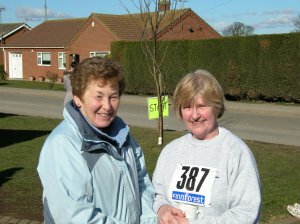 It was another fine weather day for the third NATANDY Family Fun Run at Legbourne, when a total of £625 was raised. It was a wonderful opportunity to meet up once again with some of Nat and Andy's friends. Nine month old Archie McLeish (Stuart and Lucy's baby) was joined on the Fun Walk by two other young friends (James Wishart and Alice Lamb), whose parents were friends of Nat & Andy. Well done to Archie, James and Alice who seemed to survive the course far better than their parents!!! No Stuart, the course had not been extended since last year! Well done to all those who took part and the band of willing helpers. Barbara and Roger were delighted to attend the City of Lincoln Pentaqua swimming club presentation evening when the two trophies provided by Andy and Nat's families were awarded for the first time to two young swimmers in recognition of their efforts to overcome difficulties. It was a very noisy evening but it was great to see so many swimmers, young and old, enjoying themselves along with their parents - the true spirit of the swimming family. Christmas entertainment was provided by The Lydian Choir, conducted by Rotarian Sue Hollingworth at St Lawrence's Church, Scunthorpe. 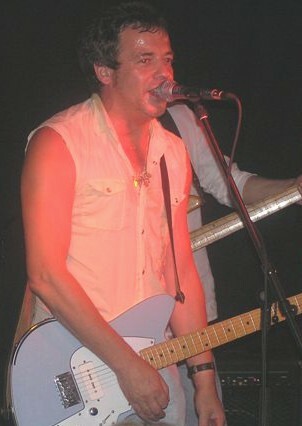 Proceeds from the concert were divided between A Dentaid Project in Honduras and the NATANDY Fund. Peter and Christine Axe hosted an At Home Lunch, which was well supported by Scunthorpe Rotarians and their partners. Total raised was £360. The second NATANDY Family Fun Run attracted over 100 entrants - some ran, some jogged, some walked and some sauntered but all had fun on a lovely fine, sunny day. Each participant was presented with a NATANDY medal. Well done to all who took part and those who worked to make the event such a success - a total of £1297 was raised. 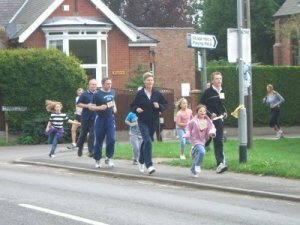 Watch out for the date of the 3rd NATANDY Family Fun Run in 2007. The organisers of the Uxfest chose the NATANDY Fund as one of the charities to receive funds from the event that took place this year at Islington Academy. This musical festival for the "younger generation" generously donated £120 to the NATANDY Fund. Just over 100 people gathered at Crowle for the Cheese and Wine Evening hosted by Barbara and Roger. Many friends travelled from as far a field as Stratford-upon-Avon, Sheffield and from all over Lincolnshire to join local people at this fun evening. We were entertained by the St John's Singers from Scunthorpe and Judy Theobald (Editor of Lincolnshire Life Magazine).....and did they make us laugh!!!! A total of £828.82 was raised for the fund. WOW - what an evening. Talented musicians, loud music, enthusiastic supporters and friendly, generous people resulted in a total of £1112.65 being raised for the fund. Billy who played at Andy and Nat's wedding reception, obviously had worked very hard to round up family, friends and fans to support this event. He promised a "fun evening" and that is just what Barbara, Roger, Sandra and Ted had from start to finish. 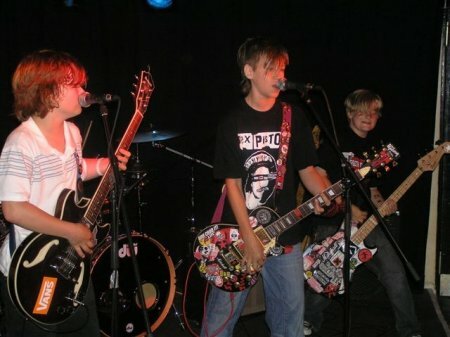 Our thanks not only go to Billy and his band members but also Paul Johnstone (Function Junction) for having the idea of the gig in the first place, the young group "Undue Noise" - raw talent and the manager of the Troubador Club. The club presented a cheque for £4,035 to the NATANDY Fund following their Swimathon event. In recognition of the huge amount raised by the club and the important part Pentaqua had played in Andy and Nat's teenage years, we decided to name our second long tail fishing boat NATANDY - Pentaqua, Lincoln UK. At the presentation evening two NATANDY Trophies, funded by Andy and Nat's families, were handed over to the club to be presented annually to a junior and a senior member for "special personal achievement." Barbara spoke to the Brigg Inner Wheel at their International Meeting about the work of the NATANDY Fund and received £100. Debbie Melhuish (a friend of Natalie's) and friend Grace took part in the Resolution Asset Management Women's 10K run held in Glasgow. 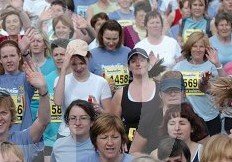 14,963 women took part this year and Debbie and Grace completed it in 65mins 40 secs without stopping!! Well done them! Between them they have raised almost £400 for the NATANDY Fund, what a wonderful achievement. You can see them in the centre of the photo wearing baseball caps. 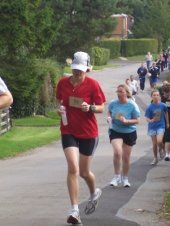 Judith Drury, manager of the Moore's Court Retirement Homes added to the amount the residents raised by taking part in the Friskney Half Marathon. The run took place on a cold and windy Sunday morning and her fantastic effort raised £200 as well as seeing her collect the 2nd prize in her age group. Well done Judith. Members of both families and some of Andy and Nat's friends were delighted to be able to attend two of the sponsored swim sessions organised by the swimming club where Andy and Nat first met. At the main session in February some 60 swimmers, parents and friends took part in the event, when over 200 kilometres was swum. Andy's brother Stuart took to the water along with old swim friends, although more chit chat took place than swimming!!!! Well done Paul and Mark for your valiant efforts!!!! Not to be left out the children who attend The Learn to Swim sessions also took part in a sponsored swim a few weeks later. Members of the Swallownest Baptist Church in Sheffield held a coffee morning and a total of £220 was raised. Members of the Marlborough Road Methodist Church in Banbury also held a coffee morning and raised £1070. Heulwen Marriott, who organised the coffee morning said "the atmosphere was very special - the eldest stallholder was in her eighties and the youngest were Brownies." 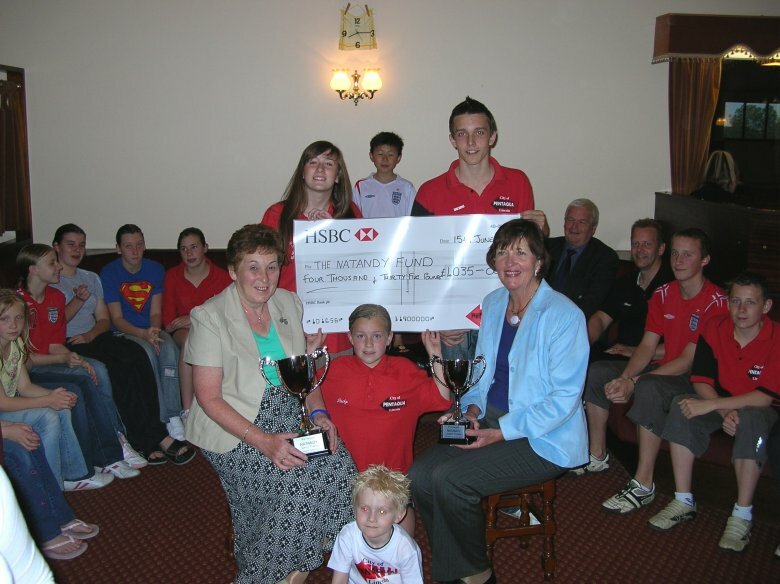 27 Jan 2006 - NATANDY fund total currently stands at £10,622.78! A fantastic effort so far. 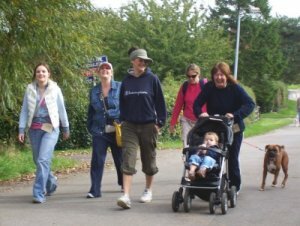 Early in 2005 members of the Linkage Community Trust in Skegness took part in a 4 mile Beach Walk from Skegness to Ingomells raising £608. After reading about the NATANDY Fund they kindly donated the £608 to the fund. 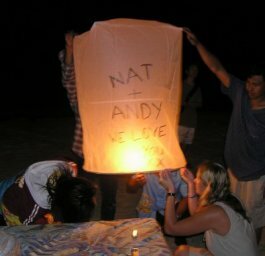 The families of Andy and Nat attended the 1st Anniversary memorial service held on the island of Phi Phi, remembering all those who died in the tragedy. 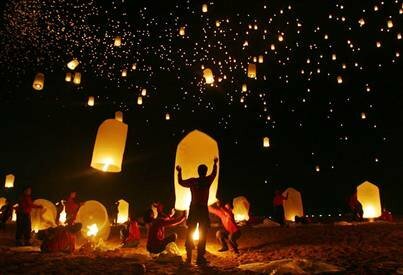 Ribbons were tied to all the trees on the island, and in the evening thousands of traditional Thai floating lanterns were lit and released in the night sky - Very moving and an amazing experience we'll never forget! More details about the day can be found at www.ppprincess.com, the website of the Princess resort where Nat & Andy were staying when the tsunami struck. 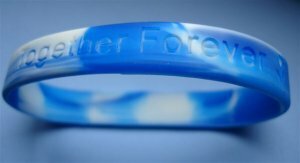 Andy & Nat were both very keen swimmers and we have chosen shades of blue for our NATANDY Fund silicon wrist bands with the message "Natandy Fund Together forever."